It rains a fair bit in Ecuador. Small streams are frequently torrents of water, thus leading to many waterfalls. Most are hidden well out of site in the jungles and cloud forests, but some, like the Cascada de Peguche near Otavalo, are quite accessible. The Cascada de Peguche is not a large waterfall, only a mere 20 metres or so, but there is an intensity to the water that is impressive. And with usually only a handful of visitors it is quite a tranquil place amongst the trees. We have been pleasantly impressed by the number of Ecuadorians who get out and enjoy the tourist sites, both natural and cultural, within their country. On most of our visits to Peguche there were only a couple of dozen people around, enjoying leisurely walks and the falls. During Carnival, however, we were among a thousand or more people – all of them spraying espuma (coloured shaving cream) and throwing water balloons at everyone else. It was a very festive atmosphere but not at all conducive to quiet contemplation of nature or staying dry! That aside, it is a lovely area with a nice easy hike through towering eucalyptus trees – at least one of which is 100 years old – along side a lovely stream. It is very family and pet friendly, and you can find a few local vendors outside the entrance selling trinkets, souvenirs and local delicacies. There are some small pools below the falls that are ritually important for the local Kichwa community. Every year before the Inti Raymi Sun God Festival on June 21, people come and cleanse themselves in order to prepare spiritually for the celebrations. I imagine that is quite a busy day as well, but more culturally significant and probably less chaotic than the espuma fights during Carnival! All in all you can’t go wrong with a little side trip to Peguche if you are in Otavalo. The place really is beautiful and there are also some impressive traditional weaving workshops in the town itself that are well worth a stop. We weren’t really prepared for the intense demonstrations of faith that are an integral part of the Good Friday procession in Quito. We had heard that the procession is an enormous event. All through the streets of the Centro Historico, thousands of people slowly march in front of the enormous glass enclosed figure of Jesus del Gran Poder, a representation of Jesus carrying his cross on the way to being crucified. 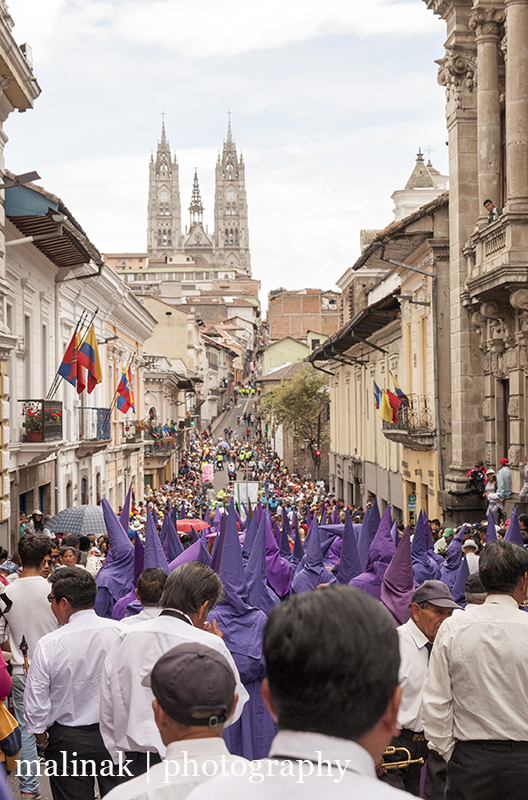 The procession in Quito is one of the largest in the world and hundreds of churches send their penitents to take part. It is a little overwhelming to see the commitment that these people undertake. Each group will have one, or more, ‘Jesus’ carrying a cross, with a crown of thorns, and invariably with chained ankles. Some of these crosses are enormous tree trunks or telephone poles and require assistants to help lift it on and off the shoulder each time there is a stop in the procession – which occurs frequently. Barefoot, over cobbled streets, and up and down the hills of Quito – this is a show of faith that is to be respected regardless of your religious leanings. Sprinkled in are people walking with cacti crosses strapped to their bare backs, complete with their blood dripping down. Arms tied out to form a cross, the physical pain to the shoulders must be intense. Women and children take part, with many of the women playing the role of Veronica – the woman who gave Jesus a cloth to wipe his face on his procession to be crucified. For the rest of the marchers, they are dressed in purple robes and tall pointed hoods and walk silently throughout. Bands play religious music and help inspire the marchers. All in all it was an amazing experience, but we decided not to wait the requisite hours to see Jesus del Gran Poder – especially since we had three kiddos under the age of 9 with us! It was another great reminder of how lucky we are in the foreign service to have these chances to see cultural events up close and in person. A hacienda conjures up grandiose historical context. The mind wanders to rolling country estates with horse-riding nobility and a grand house with Spanish ceramic tiles. You can find this type of hacienda in Ecuador, but nestled below the glowering peak of Volcan Imbabura is a different type of hacienda. At Hacienda Cusin you can wander through towering trees, past llamas languidly chewing on grass, and hole up with a good book in front of a roaring fire. Sure the horses are there as well, but Cusin is a cosier feeling hacienda. Reconstructed after decades of disrepair, the owners have recreated a historical feeling amongst the cobblestoned pathways. First established in 1602 by a powerful Spanish family, Cusin maintained an expansive presence along the valleys on the eastern end of Lago San Pablo near Otavalo. At its peak, it controlled over 100,000 acres, all but redistributed following land reforms in the mid-20th century. Now it is home to quaint rooms with fireplaces spread amongst the main house and several out buildings. The rooms each have a unique character, but it is the gardens and newly built monastery that have the most character. Trees draped with moss and bromeliads provide a canopy for various hummingbird inducing flowers. The friendly little group of llamas ignore most visitors – except when they get close enough for a kiss from my wife! And the monastery – which we first thought was refurbished, but later learned was actually completely built from scratch in the 1990s – offers surprises behind a myriad of doors. Hand carved columns, handmade furniture, a chapel and beautiful altar, and even a secret door, the monastery is a fabulous place to explore! And if you are lucky to get a sunny day, the view from the top of the tower, accessed through the secret door (if you can find it!) is stunning. If you haven’t explored enough, then check out their little farm. They have a few horses, ducks, chickens, cuy and once we discovered a huge bee’s nest. They can organize horse riding adventures, or else you can just watch the baby chicks wander around and look for their elusive rabbits. And when you’re tired of that, check out their squash court, fusbol table, ping pong table, and several movie rooms. WiFi is free in the common areas, or disconnect on a garden bench or in front of the fire in your room. Hacienda Cusin is friendly and welcoming and we all love going there – even Mosa who plays with the property’s dog Terry. The staff know us, especially Piper, and treat us like familiar friends. They know of Piper’s propensity for soup in the evenings, her tendency to fall asleep at the table soon thereafter and her desire to find the llamas! Any old ramshackle house with Spanish ceramic tiles and some gardens can call itself a hacienda, but it takes a special feel to make such a place feel like home – Hacienda Cusin is just such a place. Thanks Hacienda Cusin for the great experience for us and our guests, each and every time we go. Up. Then up some more. Then straight up. That is roughly how I would describe climbing Imbabura. By its very nature mountain climbing involves going up, but this mountain is not like the rolling inclines of Pichincha. No, it is a knock you in the lungs, step by step, assault from the moment you get out of the car. But it’s truly stunning and well worth the climb! The weather was beautiful and sunny to start as we slowly climbed up through the paramo with sweeping views of the valley and Ibarra below. However Imbabura is infamous for inclement weather on the top and before long the clouds rolled down the flanks of the mountain and grey misty conditions became our reality. This didn’t deter us in the least, in fact it was rather magical to climb through the ever rockier landscape with swirling clouds all around us. Sudden reveals of steep, rocky descents were slightly off putting to our good friend Matt with his fear of heights, but they did keep us on our toes! The climbing got a bit harder and more technical towards the top and with an increasingly restless toddler on our backs, we took the wise and well-considered decision to cut short our ascent just shy of the peak. It had been a good, but tough, climb and we all really enjoyed the day out on the mountain. That Valentine’s Day rose you bought recently may very well have grown in the sun and volcanic soil of Ecuador. As the world’s second largest exporter of roses, Ecuador is enjoying the sweet smell of success of its rose industry. Blessed with year round temperate climates, relatively sunny conditions, and volcanic soil rich in nutrients, the roses here grow tall, straight, and wonderfully robust. Driving through certain areas north of Quito you are surrounded by acres upon acres of greenhouses growing hundreds of varieties of roses. This industry has become so important that the site of the new Quito Airport was chosen partially because of its proximity to the rose growing centres. It even has its own refrigerated warehouses to ensure cold chain storage for the roses on their way out of the country. We have been lucky enough to go to one of the rose farms for a tour of their facilities and the 100 year old house. Rosadex is considered a medium rose exporter, with approximately 25 million stems exported last year. The largest rose farms will grow over 100 million stems every year! These farms are almost like little communities with day care and health care facilities on site for their hundreds of workers. The benefits the workers receive are far better than outside the industry for similar types of jobs and due to that, retention is quite high. This is crucial for the farms as the entire process is very exacting. From the planting and cultivating, through the monitoring and picking, to the final selection and packaging, each step has a kind of art to it. Familiarity with the hundreds of varieties of roses, and the different market tastes globally, will ensure that your roses are selected by international wholesalers. In the crowded field of international exports, one cannot overlook the basics of having committed and knowledgable staff. Ecuador’s major rose markets are the U.S., Europe, Russia, and China. Each has a slightly different taste for roses – short stems and large heads in the U.S., the opposite in Europe, and long and large in Russia. The Chinese market meanwhile has opened up a whole new niche job at these rose farms – dying experts. Roses dyed the most exquisite array of colours are highly sought after in China – including multi-coloured petals! It is a precise job that entails splitting the stem and putting different parts into different dyed liquid for the flower to draw up into the petals. It is largely trial by error at first, but once a process is honed, it becomes carefully guarded. Each rose farm will produce a variety of roses developed by breeders. They typically use a stock root for each plant, so it’s strong and well rooted to maximize the growing possibilities. Each rose comes with a unique name, often inspired by the breeder’s girlfriend, favorite holiday or music group – Pink Floyd, Cheryl, Hot Stuff to name a few. For every stem they sell, the breeder will get a small royalty, a huge endeavour to track, but a great benefit to the breeders who must spend hours perfecting each variety. Rosadex is a family run business that started a little over 25 years ago and is on land the family has owned for a century. It is a marvellous location complete with an old Franciscan chapel, still used for family weddings! The creaky floors and historic artefacts around the main house take you back decades, all a mere stone’s throw from a highly modernised business. Every room is filled with roses, and the decor has subtle rose hints all over it. It is the type of place you would hope to find a flower farm. Next to the house is an old barn, where the Jesuits who owned the property would keep their dairy cows and farming supplies. Today it is a magnificent showroom, home to no less than several hundred roses at any one time and historic artefacts from the property. So, the next time you are picking up roses at the supermarket, look closely as they are likely from Ecuador. We even saw a delivery of Ecuadorian roses to a supermarket in Kauai when we were on holiday! Oh, and the ones that don’t make the export market are sold here locally – 25 roses for about $4.00! If you are planning a visit to Ecuador, the Rose Farm and House will soon be open for public tours. They offer a breakfast, brunch or lunch option. Each visit includes a tour of the rose farm, the house, the chapel and old barn, and a homemade meal and drinks. It’s such a relaxing way to spend a few hours, surrounded by huge beautiful roses and enjoying delicious food in a historical setting! In 2019 they will be celebrating the 100th Anniversary of the house, so surely there will be some special celebrations – with roses of course! Gracias Martin, family and staff – pups included – for always being fabulous hosts! Oh the stories the locals will have of the time the gringos came and dug a ditch! We returned to the wonderful hospitality of Elisa’s family farm recently and could not sit idly by when there was work to be done. We thought that we would be doing normal farm tasks like our last visit, but there were larger projects to tackle. Unbeknownst to us, or Elisa, her family was responsible for helping on a community project the weekend we were there. Called a minga, each family in the community is required to assist in completing a project necessary in the area. In this case, the minga involved digging a ditch for a new water pipe. Elisa’s family had 20 meters of ditch to dig and so we went with picks and shovels and lent our not so skilled, or calloused, hands. It was good to offer a hand to the hard working and remarkably friendly family and though they protested that we should be relaxing on our weekend, I think they were quite pleased to have our help. We dug our piece of the ditch whilst people complained about where they had to work and how far it really was and how deep as well. We contended with a rickety pick-axe that repeatedly broke off in the hard soil and a different water pipe running diagonally across our ditch, but we got there in the end! One thing we were really keen to experience was seeing the whole cuy making process. Yes, cuy is guinea pig, but it is a special meal for families in this part of Ecuador and we were honoured to have the chance to enjoy it with everyone. Mamachula – the matriarch of the family – did much of the initial preparing while we were out digging our ditch. But we saw the remnants when we got back – intestines and blood and other bits that they would no doubt use somehow. Once prepared, the cuy were tied onto long spits and placed on the braai – which was a gift from us all the way from Lesotho. They use the tips of aloe plants for puncturing the skin to ensure they don’t explode from the heat and leeks to brush oil onto the skin. It is a long process with lots of turning, but we enjoyed sitting and talking with Elisa’s sisters and brothers and her dad, Papachulo – the patriach. The final product was delicious – served with potatoes, rice and a peanut sauce. Piper was once more the star of the weekend with everyone amazed at how much she had grown in ten months. She was speaking up a storm and stole ‘mamachula’s’ heart once more! She also decided to name the new farm cat ‘pescado’ – so they now have a cat named fish! Beyond our unexpected community service we helped plant maize, choclo, and beans in the family field. We picked capuli – cherry like fruits that make a wonderful drink – from a towering tree. And we cleared out several large aloe plants for a new ‘driveway’ to Elisa’s brother’s house. It was refreshing to be back in the campo under the commanding view of Cotopaxi and have the opportunity to give a little back to Elisa and her family for everything she does for us. Piper had a blast romping in the fields with Mosa and Kevin – one of Elisa’s nephews. We also had the chance to briefly go to the flower farm that we had helped last time by weeding seedlings. They have expanded from one greenhouse to five and the flowers are absolutely stunning! Competition is fierce though so the family has to consider changing crop to make it worthwhile. It is not an easy life in the campo, but the quiet hospitality and earnest nature of all made us once again feel at home. We will miss the opportunity to go back, but know that any future visit to Ecuador will see us welcomed back with open arms! Thank you Familia Maigua for always opening your home and your hearts to us. We will truly miss you. Ecuador is a country of volcanos. Tall ones, extinct ones, and iconic ones. From Quito they are visible in every direction and they truly capture the imagination. For the beauty and majesty of spotting a distant volcano on the horizon, there is something truly spectacular about living literally underneath a nearly 16,000 foot active volcano. Pichincha stands ever-present above the city and is impossible to ignore in your comings and goings. The city stretches up its lower flanks and has repeatedly been showered in ash throughout the centuries – most recently in 1999. The ever changing clouds and light playing off the expansive mountainside give texture to the shifting atmosphere around the city. And if the natural beauty wasn’t enough, there is the historical significance of the location as well. On 24 May 1822, a small battle on the slopes of Pichincha between the Royalist Spanish army and the army of independent Gran Colombia, which was a pan-Andean alliance, proved to be a pivotal turning point in the history of the independence movement of South America. Fought at 3,500 metres above sea level and lasting mere hours, the decisive engagement permitted the independent forces to control Quito and therefore united the three areas of Quito, Cuenca and Guayaquil under the independent banner of Gran Colombia. Eight years later those three city-states would merge into the newly independent nation of Ecuador. The historical significance is sometimes lost in the sheer grandeur of the place, but it bares thinking about as you pass the sheer slopes, thick paramo grasses, and unforeseen gullies on your way up the volcano in the cable car. In mere minutes the TeleferiQo will take you more than 1,000 metres up in elevation and deposit you over 4,000 metres above sea level. There, if you are lucky to have a clear day, you are treated to truly panoramic views of Quito and a dozen, often snowcapped, volcanos on the horizon. Bring your layers, as the wind whips across the open expanse, and your sunglasses, as the sun is extra intense. Then, wander up to the various viewing locations to see the entire 2.2 million person city spread out below. It is an incomparable view down, but then you turn around and see the rocky outcropping of Ruku Pichincha still another 700 metres above you. Pichincha is one massive volcano that actually split itself into two separate summits – named Wawa (Kichwa for baby or child) and Ruku (Kichwa for elder). Wawa is the higher peak by almost 100 metres, but Ruku is the more easily accessible with a trail leading up directly from the TeleferiQo station. The trail up Ruku is pretty straightforward with a series of short, steep climbs over the paramo grasses until you reach the rocky face. Skirting the Paso del Muerte (Pass of Death), the trail leads to a wonderfully energy sapping scree slope before the final scramble over the terraced rock face to the summit. We have summited Ruku twice – once just the two of us with Mosa and the second time with Piper on our backs. It is not a mountain to be taken lightly as weather conditions can change quickly from lovely to atrocious, but with a good amount of fitness and sensible caution, it is one of the easier climbs of the higher peaks. In fact, it is frequently used as an acclimatisation climb by people with plans to climb the highest peaks in Ecuador. Our climbs really couldn’t have been much different – with lovely mostly sunny conditions the first time and cloud the second time. And I mean cloud, because we were climbing in the cloud for the last parts. It gave the summit a very ephemeral feel and a sense that you were literally alone in the middle of the sky. We have been up the TeleferiQo with numerous visitors for everything from a quick look around the views near the top station to rather arduous hikes through the paramo. Every time is a little different and unfortunately only once, when Cora was up with friends, have all the volcanos, including Chimborazo 140km away, been visible. We hope to have at least one more chance to see that expansive view before we depart, but with the schizophrenic Andean weather we will just have to wait and see! In the meantime, we will enjoy the views of Pichincha with snow, cloud, and sun from Quito.